While I've seen Ahsoko Tano, in The Clone Wars, fight with two lightsabers (one in each hand), this seems to be extremely rare for Jedi. We've seen Sith do this frequently, like Asajj Ventress, with two lightsabers. Darth Maul used a dual lightsaber against Qui-Gon Jinn and Obi-Wan Kenobi and then there's General Grievous, who uses multiple lightsabers with his multiple limbs. But most Jedi use just one blade, and their lightsaber hilts tend to be simple, just a straight cylinder without much adornment, while Sith sometimes use curved grips or other more exotic stylings. Is there a reason Jedi stick with the simplest lightsaber designs and why the vast majority (at least in the movies and in The Clone Wars series) use only a single lightsaber? The limiting factor is not open hands - it's the agility of the mind to move them, and the efficacy of the training involved. I did some fencing back in college, which is light-years, if you'll pardon the expression, from a lightsaber battle, but does share some things in common, and I've studied a number of martial arts. What you're contending against in a confrontation is not the attacker's hand, foot or sword, but their coordinated will. "Coordinated" is the key word there - if the hand and feet are not moving together, you can't attack effectively. So putting another sword in someone's hand doesn't make them twice as effective, any more than trying to kick and punch someone at the same time does...it's more likely to make you fall over, or at least be off balance and open to attack. 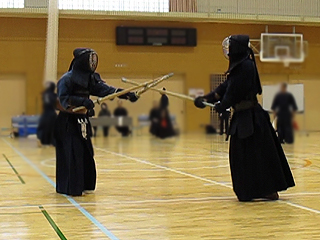 Consider the difference in footwork between kendo and fencing. 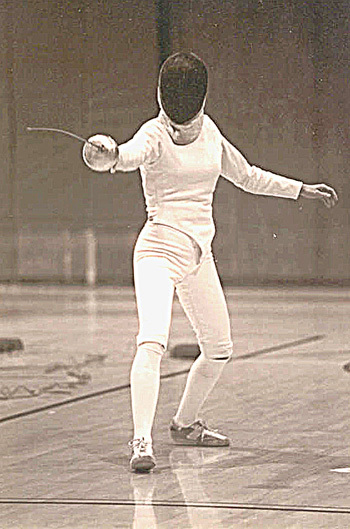 In fencing, the body is high, light and fast, moving rapidly (potentially) up and down. In kendo, the movement is more lateral, with the center of gravity lower to the ground. Kendo movement is crossovers with feet, fencing is more like natural stepping. Why? Having said all of this - the key to using multiple weapons in this context would be kata, a coordinated and heavily pre-practiced set of movements which allow the performer to coordinate those motions in a way which has been determined in advance to be effective. But there's nothing to say that these kata will, per se, be more effective than single weapon kata. It's all about the coordinated will and training of your opponent. Whether they have one weapon or two is not the question - if I started out with a weapon in each hand, I would literally toss it away (out of the reach of my opponent). I don't need the additional brainspace of managing it, and I want my hand open for balance. One more point - Count Dooku defeats a dual-wielding Anakin in short order. Obi-wan defeats a MULTIPLE-wielding General Grievous in short order. I think the real question is - why do the Sith tend to dual-wield when it doesn't seem to confer any significant advantage? Keep in mind that the Jedi Knights are primarily police. Even the Jedi who devote themselves to the martial school, like Mace Windu, do not generally train in lightsaber combat as rigorously as a Sith does. This is because the overwhelming number of factions that would oppose the Jedi and the Republic are not Force-sensitive and do not wield lightsabers. The Jedi thus train - and fight - against mostly blaster-wielders, and in those cases a single lightsaber to deflect bolts is usually more than adequate, and the focus is on mastering control of a single blade. The Jedi are also a little more regimented in their training; from Youngling to Padawan to full Knight, most Jedi initiates get the same basic training as any other, and when they progress to Padawan they are counseled by a Jedi who probably grew up in the same system. Only after a Jedi reaches the rank of Master are they learning for themselves and not being taught by another Jedi, and by then their lightsaber training is well-ingrained into the one of the seven single-saber schools. Now, the Sith came into being as a force opposing the Jedi; they were originally exiles from the Jedi Order, and created the Sith Order with the specific goal of taking their revenge on the Jedi. As a result of both that, and the nature of the Sith themselves to fight each other for dominance, Sith expect other Force-sensitives as opponents. So, they train very rigorously in lightsaber combat, especially saber-vs-saber styles like the very antiquated Form II, and adopt novel styles of combat (such as lightwhips, ergonomic "fencing" sabers like Dooku's, staff-styles like Maul's, and yes, double-saber styles) that are unfamiliar to even experienced Jedi. As a result, Sith more often than not mop the floor with the average Jedi Knight. Also remember that the Dark Side can make one very powerful, very quickly. It can take decades to become a Jedi Master. Count Dooku was already a very experienced Jedi Knight before falling to the Dark Side, and as such it took one of the most experienced Jedi - Yoda - to stand a chance against him, and even then the fight was a stalemate. It took an even more powerful (and emotionally unhinged) Jedi - Anakin - to finally defeat him, and it's also thought that Palpatine told Dooku to hold back against Anakin. When Obi-Wan tossed Anakin a second lightsaber in Ep. II, Anakin was able to draw on the Force to be effective in dual-saber style, but he was obviously inexperienced in that style; according to EU sources, Anakin practiced Form V, which is very strength-dependent, and is more suited to two hands on one saber for leverage. His unfamiliarity with dual sabers, and with Form III or IV which would have been better suited to using two sabers, resulted in a mistake that lost him one of the sabers. So, he reverted to his natural single-saber Form V style, which lasted longer as he was more comfortable and experienced in that style. He still lost to Dooku, who first had a few decades' experience as a Jedi over both Obi-Wan and Anakin, and second had trained even more purposefully under Palpatine to fight Jedi using Form II, which is antiquated but highly effective against a lightsaber-wielding opponent. We never saw anyone use more than one lightsaber in the original trilogy. Of course, the only three lightsaber-users in that trilogy were Obi-Wan, Luke and Vader, so it's a relatively small pool, but the initial stage direction Lucas gave all the lightsaber-wielders was a very heavy Kendo style, as if the lightsaber blade were as heavy as a nodachi or broadsword. The development of alternate weapons and fighting styles was originally developed in the EU through fan involvement, including the background behind the physics of a lightsaber like the fact that the blade is near-weightless but subject to other forces. Elements of the EU then bled back into G-canon in the prequel trilogy as Lucas and the scriptwriters looked for ways to kick the fighting up a notch from the original trilogy. The first change was to the pace of fighting; the choreography drastically increased in tempo. The second was the inclusion of alternate fighting styles and variations of weapons. We never did see a lightwhip, but dual-saber and staff styles made it from the comics and novels to the movies. Among other reasons, Jedi are not warriors! They are trained for combat, but combat is not what they intend. OTOH, Sith are. The same way a SpecOps teams' will be severely more advanced, different, and fancy compared to a random non-SWAT cop (especially a Bobby). Also, anything beyond a single regular lightsaber for a Sith also seems to be a rarity, though I didn't research this extensively. Your question only lists 1 dual-bladed LS and one 2-lightsaber Sith (Grievous doesn't count, not being Force sensitive). A simple answer may well be that they seem to be loosely based around samurai, who's primary sword style used the katana (a weapon intended to be wielded with both hands). From a practical standpoint, I'm a student of Modern Arnis which is a weapon style revolving around the use of two sticks (or blades, such as machetes). I can tell you from much training that effectively using two weapons in combat is very difficult. The simple act of striking and defending without causing the weapons to entangle takes months of training (much less doing so in a stressful environment, and with adrenaline pumping through you). If you were working with a weapon that didn't have a single safe edge you probably wouldn't want to take the risk. Another possibility, from my Kendo training: many people don't realize that when one person strikes another's weapon with any amount of force, it takes effort to prevent that weapon from rebounding back at you. Going back to the "no safe edge" argument, it could be that a Jedi wouldn't want his balance and attention compromised so that he could focus more heavily on keeping the weapon safely focused on the enemy. Finally, from a realistic standpoint: did you realize that for the original movies, the lightsaber effect was generated by going back manually by hand and drawing the effect onto each individual frame? That's a ton of work. Two lightsabers means double the time invested! Modern technology makes this much simpler. First, there is more then one lightsaber fighting style. One thing to keep in mind is the the Jedi are "space samurai", they are disciplined warriors that fight primarily defensibly. Their training is exceptionally conservative because the Jedi order fear their own falling to the ever persuasive dark side (fear of one falling to the dark side is an almost paranoia level fear by master Yoda and others). The most defensive fighting style with a lightsaber is two hands on one sword, much like a samurai katana. Over time Lucas had them take more aggressive postures, but never something as brash as two lightsabers. That would be foolish and reckless in a Jedi's eyes. Jedi favor delicate control over raw power, contrast this to Sith techniques. Sith are not as disciplined in their fighting style, utilizing multiple lightsabers, different kinds of lightsabers, and experimenting with synthetic crystals. They are more likely to break the rules in pursuit of their ambitions. One theme that runs through the Jedi code is to resist the desire for power. Wielding two blades or a double blade was widely seen as too powerful for a Jedi to contain, much like the Vaapad fighting stance. The only Jedi to use Vaapad was Mace Windu, and his ability to focus the dark side of the force to do so was extremely uncommon. On the other hand, Sith are encouraged to feed their passion and lust for power. Wielding multiple blades or an exotic blade is far more in line with grabbing power. Additionally, the Sith focused on aggression and offense. The Jedi method was defense and mitigation. A multi wielder has no ability to defend well, but they can certainly attack rapidly and aggressively. Given that lightsabers are very light and that they function as much as a shield as a sword, it would make sense to wield one in each hand. However, when encountering another lightsaber, strength comes into play. As such, a two handed grip on a single lightsaber would provide more strength and more leverage, preventing your opponent from simply pushing your lightsaber back into your body. With regards to Darth Maul, I'm fairly certain his lightsaber would be more of a hindrance than a help in any combat, due to the fact that a good number of the possible ways he could hold his lightsaber would result in one end encountering his own body. It worked as a decent defensive weapon, which is likely why he waited until he was attacked by two Jedi before activating the second part of the blade. I have a other answer coming from the books "Darth Bane: Path of Destruction"
When Bane was training under Kas'im, Kas'im told Bane that a double bladed lightsaber (or in extend 2 lightsabers) give no advantages at all, except when the opponent is intrigued by the weapons. "So the double-bladed weapon gives you more options?" "No, but you think it does, so the effect is the same." It's all about trying to get that little advantage over the other in battle. "Firstly, as both hands held individual lightsabers, two-handed blows were impossible, and the duelist was unable to put all his or her weight behind blocks, weakening the defensive capabilities. Thusly, an enemy with a single hilt could simply assault a Jar'Kai practitioners defense with brute force, battering away until the dual-blade duelist's guard gave way, as shown during Anakin Skywalker's duel with Asajj Ventress on Yavin 4. However, this weakness was hardly absolute, as some duelists possessed the physical strength to block power attacks with only one arm, examples including Grievous, whose mechanically augmented strength allowed him to both effectively defend against and dole out heavy power blows. Asajj Ventress eventually developed the physical strength necessary to compensate for this weakness, being able to hold up simultaneous bladelocks with both Anakin Skywalker and Ahsoka Tano, both of whom were Form V practitioners." Here is several unrelated examples of dual-wielding or double-bladed lightsabers in the EU. Luke Skywalker and Mara Jade Skywalker used a shoto lightsaber to battle Lumiya in the Legacy of the Force series. Bastila Shan, a character from KOTOR, uses a double-bladed lightsaber in KOTOR. The character that you play as in KOTOR can dual-wield lightsabers later on in the game. Luke Skywalker used Jacen Solo's lightsaber in the New Jedi Order series to rescue Jacen early on in the war with the Yuuzhan Vong on the planet Belkadan. These are only a few examples, but they all seem to be exceptional Jedi. Luke and Mara were Jedi Masters, Bastila was called a exceptional Jedi in the story, and the main character was a former Sith Lord and one of the best Jedi at the academy. To answer the question about special lightsaber handles. Tenal Ka from the EU has a curved rancor tooth lightsaber as evidenced in the Young Jedi Knights series where she builds it. Lightsabers are nearly impossible to wield efficiently without the aid of the Force because the only weight on the weapon is in the hilt. The plasma blade weighs nothing, so the weapon is terribly balanced and highly unpredictable. Stabilizing and keeping tabs on more than one at a time takes an even larger amount of effort and training. It's really much more practical for your average Jedi to use one. Lightsabers are like katanas, and you could use one in each hand but then you have to use your entire body when you engage somebody and it becomes more of a dance, same goes for using a staff. Using both hands on a weapon means you can use your entire strength to block a power attack or perform one. Sure lightsabers are able to cut through flesh very easily but using only one hand will reduce the power that can be brought to bear. Against an opponent that can counter your attacks this is a significant disadvantage. Staff attacks are very easy to predict before one end is the complete other side to one, meaning keeping track of both with little training makes it a fairly meaningless offensive weapon but it's a great defensive weapon. Maul used one because in the PAST Jedi/Sith used them often but they had fallen out of favor of the Jedi so it was a scarce tactic and wasn't common that all Jedi were trained to combat it. Using two sabers at once is fairly similar if you put forward one hand to attack you can't be putting the other one forward at the same time, so you can keep track of them like that plus the most force you can get wielding like that is a twisting action. It's all about fighting and how your body moves and how much you want to move during a fight.. if you flip around like an idiot an entire fight you run out of energy. A single saber can be used in many different ways. Luke Skywalker has been known to use a short lightsaber during battle with Lumiya because she uses a light whip which is a very dangerous weapon but not a very strong weapon. Its cutting edge is weak but dangerous so using two sabers to protect more of your body is a good idea, otherwise you have to lose ground while defending leaving you with less chance to beat your opponent unless they make a mistake. What about Lightsabers and Jedi Philosophy makes them so rare and special, and why not carry/have spares(some Jedi have 2 some only have 1)? Why do Jedi use lightsabers? Would dual saberstaffs offer a greater advantage to other lightsabers? How could Asajj Ventress be a Sith if there can't be more than two of them? Did Kenobi use the dark side against Maul in Episode I (Phantom Menace)? Why wasn't the Separatist Army more lightsaber resistant?